Om. Found this great little company at last weeks Fashion Co-op. 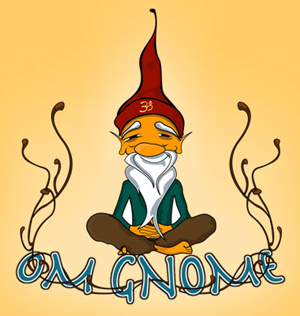 Picked up a great Alternative Apparel sheer kelly green tee with the signature Om Gnome on, that i’ve been living out of the last week, and it just raises my spirits every time. He’s just so chill. And relaxed. And eminates that “everything always works out” vibe… just go with the flow? Definitely looking forward to seeing their upcoming line of Gnome yoga and active wear. NOTA BENE for all NOTCOT readers :: They will be exhibiting at this Sunday’s ThreadShow in San Diego at Balboa Park, which should shape up to be a fun filled day of shopping, art, music, and hopefully gorgeous weather (and the perfect christmas shopping spot?) Anyhow, i guess i’m trying to say it’d be fun to meet readers/design enthusiasts/new people, so drop me an email if you’ll be there.